Home » FREEBIES » 12 Instore FREEBIES List ! So easy ! This week having Ibotta is a MUST! If you don’t already have Ibotta [ CLICK HERE ] to sign up and get started. Make sure you download the Dollar General app and the walamart.com app too! Many of the walmart freebies were not in my store, and having the walmart.com app saved me time so I didn’t have to roam all the isles looking for items. Brickseek.com is super helpful too! If you liked this In store Freebies list let me know and I will make more! 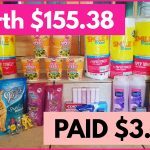 HUGE FREEBIE DEAL [ HERE ] – Get free toothpaste, Razors, and Persils Laundry detergent! OR use the digital Coupon inside the Walgreen’s App. FREE + $0.12 Cent MONEY MAKER! Load the $1.25 ” Hidden ” Coupon. Go [ HERE ] for instructions on how to do that. [ CLICK HERE ] to load the 9 lives ” hidden” coupon. FREE + Make $0.25 Cents! Don’t forget to [ CLICK HERE ] to see this weeks Penny list! Where did you get the CBD oil from? I couldn’t find a link to it.